On March 19, 2003, American and British forces began the Third Persian Gulf War, a conflict which became popularly known as "The Iraq War." The U.S. government referred to this conflict "Operation Iraqi Freedom." Regardless of what it is called, this conflict is by far the first truly major war of the 21st Century. While considered by many to be another part of the "War on Terror," it is in many ways separate and unique in its own right. In scope of preparation and potential consequences, the new war in Iraq by far overshadows the earlier invasion of Afghanistan. **Note: The History Guy Website considers this the Third Persian Gulf War, following two previous major international wars involving Iraq in the Persian Gulf region. The First Persian Gulf War lasted from 1980 to 1988 and pitted Iraq against Iran. The Second Persian Gulf War began in 1990 with Iraq's invasion and occupation of Kuwait and ended in 1991 with a Coalition of nations under United Nations authority and led by the United States which forcibly ejected the Iraqi military from Kuwait. **Nations and groups in red denote actual combat involvement thus far. ENDED: December 15, 2011 -U.S. Withdrawal Officially ends. There are several basic reasons for the second major war between a United States-led coalition and Iraq. First, there was the lingering tension and hostility left over from the Gulf War of 1991, in which Iraqi occupation troops were forced out of Kuwait. As a result of this war, the Iraqi government agreed to surrender and/or destroy several types of weapons, including SCUD missiles and various Weapons of Mass Destruction (WOMDs). The United Nations were allowed to send weapons inspectors to confirm the destruction of Iraqi weapons and also to search for prohibited weapons believed to be in hiding. Also, two "No Fly Zones" were established over northern and southern Iraq for the protection of Iraqi minority groups in opposition to the Saddam Hussein government. Over these two zones, Allied aircraft patrolled the air in order to prevent Iraqi aircraft from attacking northern Kurds or southern Shiites. Over the years, Iraqi air-defense forces fired missiles and other weapons at the Allied warplanes (mostly American and British planes) in unsuccessful attempts to shoot them down. In response to these attempted shoot-downs, Allied warplanes often responded by bombing the air-defense sites and the radar installations associated with them. (see outside link: http://www.ccmep.org/usbombingwatch/) In 1998, under Iraqi pressure, the UN weapons inspectors left Iraq, prompting the United States to launch a severe three-day bombing campaign called "Operation Desert Fox." Following this, Iraqi forces significantly increased attempts to challenge the Allied planes patrolling the No-Fly Zones, thereby also causing an increase in the Allied bombing of Iraqi targets. On Monday, March 17, 2003, President Bush issued an ultimatum for Saddam Hussein and his sons to enter into exile within 48 hours or face military conflict. Saddam defiantly refused, thereby setting the stage for Bush's order for war to begin. 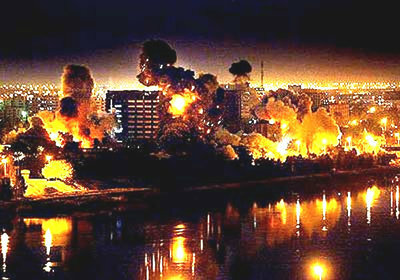 On March 19, 2003, at 5:34 AM in Iraq, (6:34 PM on the U.S. West Coast), U.S. Stealth bombers and Tomahawk Cruise Missiles struck "leadership targets" in and around the Iraqi capital of Baghdad to begin the second major war between a United States-led Coalition and Saddam Hussein's Iraq. Soon thereafter, air attacks began against Iraqi targets in southern Iraq, followed by missile attacks from Iraq toward U.S. military positions in the Kuwaiti desert. The stated goals of the Coalition were the disarmament of Iraq and the overthrow of Saddam Hussein and his Baath political party. On the first full day of the war, March 20, U.S. and British ground forces advanced into southern Iraq, entering the port city of Umm Qasr, near the major Iraqi city of Basra, while a second wave of air attacks hit Baghdad. Over the next several days, Iraqi militia (known as the Saddam Fedayeen), and holdout troops continued to resist Coalition forces, inflicting several casualties. By March 23, Coalition forces had seized H-2 and H-3, airfields in western Iraq, and controlled parts of Umm Qasr, Basra and Nasiriyah. Armored and mechanized forces had advanced to within 100 miles of Baghdad and forced a crossing of the Euphrates River at Nasiriyah, where Iraqi forces put up a stiff fight. In northern Iraq, the U.S. launched an attack with 40 to 50 cruise missiles on forces of two Islamist parties opposed to the Pro-U.S. Patriotic Union of Kurdistan (PUK). These two groups are Ansar al-Islam (Supporters of Islam), believed associated with Osama bin Laden's al-Qaida and Komala Islami Kurdistan (Islamic Society of Kurdistan). Also on March 23, U.S. forces began airlifting troops into Kurdish-controlled northern Iraq in what appears to be the opening move toward a second front against Iraqi forces. Also on March 23, Iraqi forces ambush the U.S. Army's 507th Maintenance Company. March 27: Fierce fighting erupts in the city of Samawah, where U.S. forces are faced by up to 1,500 Iraqi irregulars at a vital bridge over the Euphraties River. U.S. forces eventually take control of the bridge and continue the advance to Baghdad. In northern Iraq, approximately 1,000 paratroopers of the U.S. Army's 173rd Airborne Brigade parachuted onto an airfield in an effort to open a northern front against Iraqi forces. Within days, Kurdish Peshmerga troops of the PUK, along with U.S. special forces units, assaulted the stronghold of the Ansar al-Islam group along the Iranian border. By the tenth day of the war on March 29, U.S. forces had advanced as far north as Karbala, where large battles with Iraqi forces took place. Major combat continued at Najaf, Nasiriyah, Basra and other locations as Iraqi guerrilla forces, many of whom belonged to the Saddam Fedayeen, proved to be formidable forces for the Coalition to overcome. Bombing raids on Baghdad and other Iraqi cities continued, as did Iraqi attempts to hit Kuwaiti-based targets with surface-to-surface missiles. One missile successfully hit Kuwait City on March 28, inflicting damage on a shopping mall and causing minor wounds to two Kuwaitis. Also on March 29, the first suicide bombing on Coalition forces occurs, killing four American troops at Najaf. March 30: Six hundred British commandoes attack near Basra, destroying Iraqi tanks and capturing nearly 300 prisoners. April 1: U.S. forces rescue Pfc. Jessica Lynch and recover the bodies of several other members of the 507th Maintenance Company. April 3: U.S. forces reach Saddam International Airport on the outskirts of Baghdad. April 5: U.S. armored forces enter Baghdad, conducting a large raid. Such incursions would continue for several days. Iraqi civilians begin widespread looting of the city. April 7: British forces reach the center of Basra and declare the city is under Coalition control. April 9: U.S. troops help Iraqi crowds topple a large statue of Saddam Hussein. Coalition forces continue to extend their control over the city. April 10: Kurdish fighters seize the northern city of Kirkuk from the Iraqi forces. April 11: U.S. and Kurdish troops enter Mosul in the north. April 13: U.S. forces enter Saddam's hometown of Tikrit. April 15: Tikrit falls and the Coalition declares the war to be effectively over. Despite this declaration, violence continues, escalating into a low-grade guerrilla war. April 16: U.S. forces capture Abu Abbas, a Palestinian terrorist living in Baghdad. Abbas is best-known as the leader of a group which hijacked the Italian cruise ship Achille Lauro in 1985. Abu Abbas later died in American captivity. July 22, 2003: Udai and Qusay Hussein were killed by troops of the U.S. 101st Airborne Division. December 13, 2004: Saddam Hussein is captured. Between mid-April, 2003 and early April, 2004, most hostile actions were between the Coalition forces and the old Saddam holdouts and a growing Sunni resistance. Then, on April 4, 2004, as American troops were already engaged with Sunni insurgents in Fallujah, an uprising was launched by the Shiite Mahdi Army, a militia organized and led by a Shiite cleric, Muqtada al-Sadr. In 2007, the United States increased the number of troops in Iraq in what became known as "The Surge." Nearly 20,000 additional troops were introduced into the Iraqi battlefield, with the intention of providing the commanders on the ground more options with which to battle the ongoing insurgency. Most analysts agree that the Surge forces enabled the Coalition and the Iraqi government to reduce insurgent attacks and terrorist activities. After the election of Barack Obama as the President of the United States, a drawdown of U.S. forces began. Violence continued though as terrorist attacks continued (at a reduced rate) against Iraqi targets and against American troops. In June, 2011, for example, 15 U.S. troops died in several separate attacks (attributed to the Iranian-supported Shiite militia known as Kata'ib Hezbollah. 1. Prior to the outset of the war, the Peace/Anti-War Movement in North America and Europe grows and conducts many large-scale demonstrations against President Bush and the plans for war. 2. In the United States, a well-organized Pro-War/Pro-Troops Movement forms in order to challenge the anti-war activists and to support the President and the U.S. military. 3. Saddam Hussein, recognized leader of Iraq since 1978, loses power, is captured, put on trial by the new Iraqi government, and executed. 4. Even though major combat ended, as declared by President Bush on May 1, 2003, the escalating guerrilla war damages American public support for the war. ABCNEWS.com: War With Iraq - news, reporters' notebooks, analysis, live and archived audio and video. Redeployment of the Jedi--by Colonel Christine D. Cook, USAR. A Personal Experience Monograph about reintegration of officers when they return home after deployment to a combat zone. CBS News.com: America at War - news, headlines, live audio and video, polls, and other coverage. Defense Tech - defense and military weblog featuring news and links. Edited by Noah Shachtman. DefenseLINK News: Saddam's Days Numbered, Rumsfeld Says - news article where Secretary Donald Rumsfeld names the invasion of Iraq. Financial Times UK: War in Iraq - news coverage, analysis, features, and commentary about the war in Iraq. Frontline: The Long Road To War - offers photos, video, analysis, and an overall chronology of America's long confrontation with Iraq. GlobalSecurity.org: Operation Iraqi Freedom - offers the latest reports about the military invasion of Iraq. GuardianUnlimited: War with Iraq - Flash presentation showing locations of Allied military bases and plans for the air campaign. Includes a day-by-day attack chronology. Ha'aretz: Showdown With Iraq - features in-depth coverage of the conflict. Iraq Body Count - public database of civilian deaths in Iraq resulting directly from military action by the USA and its allies in 2003. Iraq: A Decade of Defiance and Deception - official White House page. Los Angeles Times: War With Iraq - includes the latest news and analysis of the war in Iraq. Military.com: Eye on Iraq - features news, war reports, and information on the equipment being utilized. MSNBC.com: Target: Iraq - news, features, maps, and more. New York Times: Iraq Navigator - directory of online resources relating to Iraq and the war in Iraq, including military resources, biographies, statements, organizations, and media coverage. Free registration required. Operation Iraqi Freedom - features daily Defense Department news and briefing about the conflict in Iraq. President Bush Addresses the Nation - transcript and video of President George W. Bush announcing the start of the war in Iraq on March 19, 2003. President Says Saddam Hussein Must Leave Iraq Within 48 Hours - transcript and video of President George W. Bush's address to the nation on March 17, 2003. Reuters Raw Video - un-narrarated war-related video footage and live news conferences, government briefings, and other events. Telegraph: Iraq factfile - archive of news and background information on the 2003 war in Iraq. Text of a Letter from the President to the Speaker of the House - features the text of a letter from the President to the Speaker of the House of Representatives and the President Pro Tempore of the Senate from March 19, 2003. Times Online: Iraq - ongoing coverage of the war in Iraq, including analysis of Prime Minister Tony Blair's decision to support the war. UNEP Conflict and the Environment in West Asia - series of reports assessing the environmental effects and repercussions of conflict and war in Iraq, Kuwait, and the surrounding region. The Gulf War--History Guy page on the 1990-1991 Gulf War. The "No-Fly Zone War" --History Guy page on the 1991-2003 conflict between the U.S./U.K. Coalition and Iraq. The Iraq Foundation --"is a non-profit, non-governmental organization working for democracy and human rights in Iraq, and for a better international understanding of Iraq's potential as a contributor to political stability and economic progress in the Middle East. "*Descriptive statement is from the Iraq Foundation website. DOD 101: United States Military Operations-- Fascinating website run by the Federation of American Scientists. On this site you will find tons of data on US military operations going back decades. Iraq History-- A very detailed accounting of Iraqi/Mesopotamian history covering Biblical times to the Present. UNSCOM-- The United Nations Special Commission, the organization that conducts the weapons inspections in Iraq. This page is part of the UN website. Iraqi Rulers--Part of the Iraq4ever website. Lists the rulers of Iraq from independence to the present. Iraq History--Part of the Iraq4ever website. Includes quite a bit of detail on the history of Iraq and the Mesopotamia region. ABCNews.com: Saddam Hussein - Provides biographical background and links to news stories. Biography of President Saddam Hussein, President of the Republic of Iraq - From the Republic of Iraq Ministry of Foreign Affairs. CNN.com: Hussein - The Man the U.S. Loves to Hate -Analyzes Hussein's background and motives. CNN.com: Transcript of Saddam Hussein's Speech to Iraqis - From September 3, 1996. Emergency Net: Hussein - Offers biographical background. Iraq Today: Saddam Hussein's Speech - Provides text of President Hussein's speech on the 11th anniversary of the Great Victory Day. Megastories: Saddam's Early Life, the Lust for Power - Provides background on Hussein and his family. MSN Encarta Encyclopedia: Saddam Hussein - Features career overview. Saddam Hussein and His Profile - Critical analysis of Hussein's leadership. Saddam Hussein, President of Iraq - Features personal and professional background. Who 2: Saddam Hussein - Features background and annotated links. Frontline: The Survival of Saddam - Portrait of Saddam Hussein's life and the secrets behind his leadership. Features interviews, rare photographs, and Saddam "music videos." You can try out our 642-427 exam and latest 70-648 to get high flying success in final 220-701 and 646-230. Our mcsa exams is also very useful tool. Dept. of Veterans Affairs Gulf War Fact Sheet--Includes information on Programs available for Gulf War Veterans. Gulf War Veteran's Homepage--Dept. of Veterans Affairs web page on Gulf War Vets. GulfLINK--Office of the Special Assistant for the Gulf War Illnesses. An official Dept. of Defense site. GulfLINK Declassified Documents - Recently declassified military and CIA documents concerning Gulf War Illnesses. SVAC Hearing Testimony-- UNITED STATES SENATE COMMITTEE ON VETERANS' AFFAIRS. Hearings on Persian Gulf War Illnesses. Gulf Veteran Resource Pages - the first and primary source of information on the Web for Gulf War Veterans suffering the mysterious collection of maladies known as Gulf War Syndrome. Gulf War Veterans of Wisconsin - assists Wisconsin residents affected by the complexities of Gulf War related illnesses. Keeps the public informed of issues that affect their veterans' well-being. KuwaitOnline- Internet source for Kuwait information. Lee, R. "The History Guy: The Third Persian Gulf War (The Iraq War)"